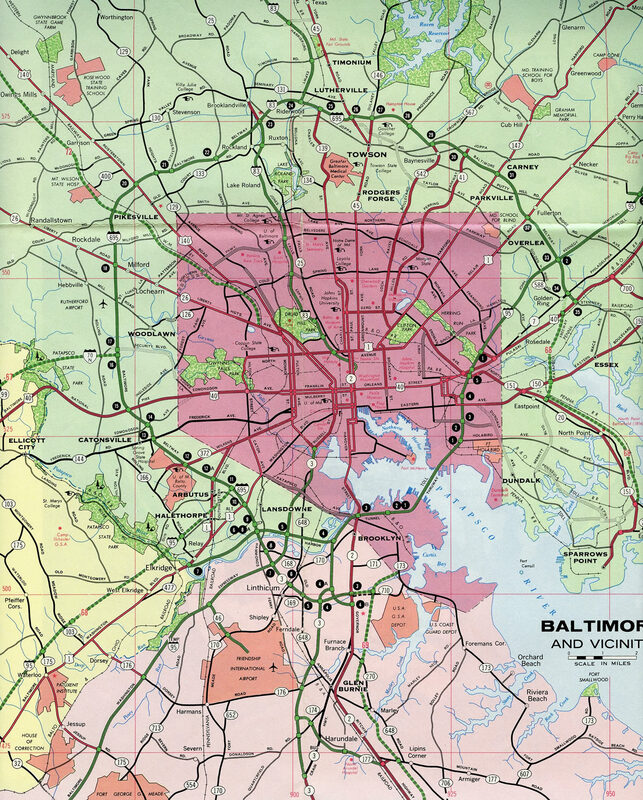 Interstate 895 constitutes a nearly 15 mile route parallel to Interstate 95 through the city of Baltimore. Known as the Baltimore Harbor Tunnel Thruway, the Interstate is a toll road with the exception of the stretch between Exit 12 (Lombard Street) and the north end at Interstate 95. I-895 provides a viable alternative to the often congested Fort McHenry Tunnel of Interstate 95, with the exception that the Harbor Tunnel is prohibited to trucks because of a 13 foot 16 inch height restriction at the Patapsco River under crossing. Cash toll rates at the Baltimore Harbor Tunnel increased from $1.00 to $2.00 per passenger vehicle between June 2003 and 2004 and again to $3.00 on November 1, 2011. A further increase to $4 per passenger vehicle took take place on July 1, 2013. Discounts were applied to Maryland based E-ZPass accounts on July 1, 2015. 1957 tolls were set at just 40 cents. A two-pronged spur of Interstate 895 connects the Baltimore Harbor Tunnel Thruway with both Interstate 97 (Glen Burnie Bypass) south and Maryland 2 (Ritchie Highway) south in Anne Arundel County. 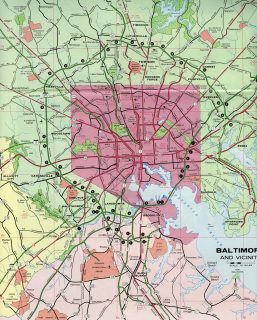 These roadways opened in 1957 to feed traffic to the Harbor Tunnel from the Glen Burnie area and Baltimore Beltway. The Maryland State Highway Administration classifies these spur routes as Interstate 895A and 895B, though neither are signed in the field. Instead signs posted along the freeways simply refer to the routes they connect with. The Harbor Tunnel Thruway provided a direct connection to the John F. Kennedy Memorial Highway, but was never formally considered a part of Interstate 95. Sequential exit numbers on the toll road were unusual in that they increased both north and south from the Harbor Tunnel. The Harbor Tunnel Thruway provided the main route for I-95 through traffic across the city of Baltimore until the Fort McHenry Tunnel opened to traffic on November 23, 1985. Crossing Herring Run, Interstate 895 separates in 0.4 miles for ramps to both the I-95 Express Lanes toward White Marsh and the Interstate 95 mainline to Wilmington, Philadelphia and New York. Photo taken 12/21/12. Ramps join Moravia Road with Interstate 895 as the Express lane ramps separate. There are no remaining exits from the Harbor Tunnel Thruway north. Photo taken 12/21/12. A wye interchange connects the ending I-895 north with Interstate 95 at the Baltimore County line. The freeway advances east to become the John F. Kennedy Memorial Highway through Harford and Cecil Counties. The I-95 Express Lane flyover drops onto the left side of I-95 north here as well. The toll lanes travel eight miles to merge with the mainline beyond Maryland 43 (Exit 67). Photo taken 12/21/12. Two miles ahead of the split with Interstate 895 (Harbor Tunnel Thruway) along I-95 south. Construction completed by fall 2011 shifted the forthcoming wye interchange from a left side ramp to I-895 to the right. Photo taken 10/12/14. Approaching the Chesaco Avenue overpass, the four lanes of Interstate 95 south partition with three continuing to the Fort McHenry Tunnel and two for the Harbor Tunnel via I-895. Photo taken 10/12/14. Interstate 895 provides a good alternative to I-95 for motorists heading south to Washington. Guide signs however reference Annapolis instead for the I-895 Spur connection to Interstate 97 near Glen Burnie. The toll road also connects with Moravia Road and U.S. 40 (Pulaski Highway) nearby. Photo taken 10/12/14. A lengthy flyover departs to the left from the ending I-95 Express Lanes as Exit 62 leaves the Interstate 95 mainline for I-895. I-95 and I-895 cross paths again prior to their respective tunnels across the Patapsco River, but without direct access to one another. Photo taken 10/12/14. Interstate 895 (Harbor Tunnel Thruway) straddles wetlands and industrial areas along the Patapsco River from the Baltimore Beltway to Exit 1 with U.S. 1 (Washington Boulevard) south. Generally paralleling I-95, U.S. 1 travels south to Elkridge en route to Laurel and Beltsville. Photo taken 10/12/14. Interstate 195 (Metropolitan Boulevard) passes over I-895 south as Exit 1 departs for U.S. 1 (Washington Boulevard) to Elkridge. The wye interchange here represents the pre-1973 end of the Harbor Tunnel Thruway. Photo taken 10/12/14. Turning more west, drivers on I-895 south cross over the Patapsco River to enter Howard County. The remaining mile of the Harbor Tunnel Thruway reduces to a single lane to the wye interchange with Interstate 95 south. No signs are posted making the end or transition to I-95. Photo taken 10/12/14. One half mile ahead of Interstate 895 (Harbor Tunnel Thruway) on I-95 north in eastern Howard County. There are no northbound exits from I-895 until after the K-Truss Bridge and adjacent toll plaza. This overhead replaced a ground-level sign by 2010. Photo taken 12/21/12. Entering the wye interchange (Exit 46) with Interstate 895 north on I-95 north. Interstate 195 (Metropolitan Boulevard) joins I-95 with BWI Airport and Catonsville next while the Thruway travels eight miles to the Harbor Tunnel toll plaza. Photo taken 12/21/12. 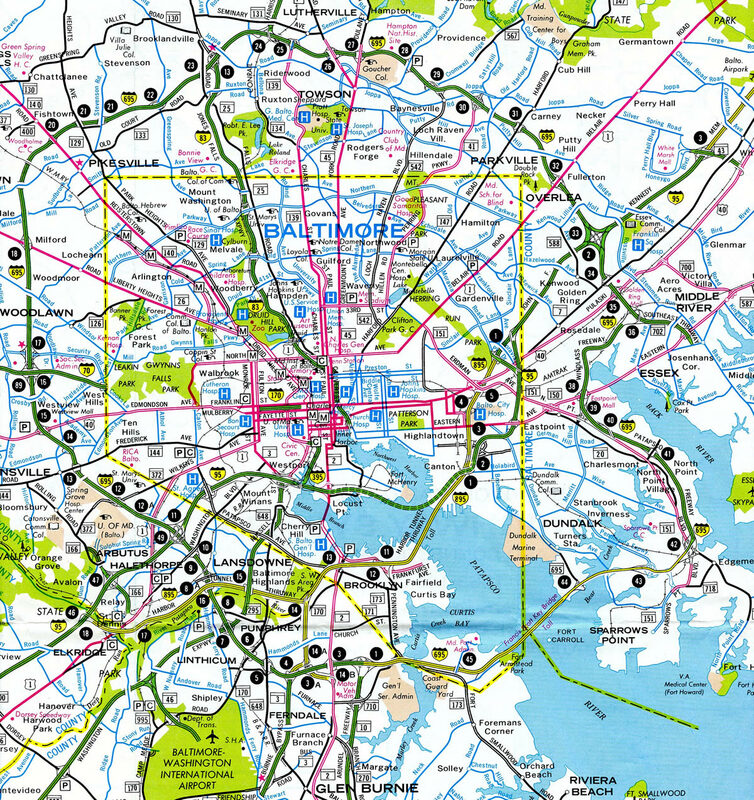 “Five-year construction project on I-895 north of Harbor Tunnel to begin 2016.” The Baltimore Sun (MD), November 13, 2014. “Major I-895 bridge project underway.” WTOP, June 19, 2016. Harbor Tunnel Thruway (I-895) @ DCRoads.net. “Express toll lanes on I-95 north of Baltimore set to open Dec. 6.” The Baltimore Sun, November 14, 2014. 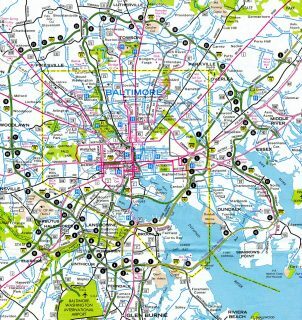 “Construction on I-895 in Baltimore to cause major traffic problems for the next three years.” The Baltimore Sun (MD), November 9, 2018. Page updated July 21, 2016.